This house was built by Madame Marie Ferree's son, John, about 1719. An addition was put on later by his grandson. The property is located on what was the southeast corner boundry of the original Ferree grant. John also had land on the northeast corner and acquired the tract of his sister, Jane Ferree Davis, on the southwest corner after the death of her husband. Photo and description by David R. Bamberger. 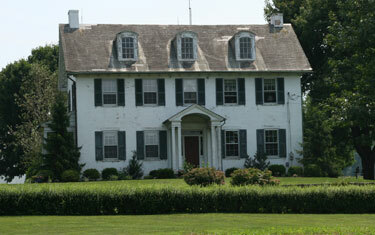 Mr. Bamberger stated that the original house is most likely the white structure behind this house. I am descended from Daniel Ferree and Marie Warenbuer Ferree through their son, John, and his wife Mary Elizabeth Musgrave (my sixth great grandparents). The Descendants of Marie Ferree held a reunion in July 2007. Yvonne March and I traveled from Perryville, MD to Lancaster, PA to the Continental Inn on Highway 30 (the Lincoln Highway) where we stayed and where the meetings and banquet of the Ferree Family Reunion were to be held. We arrived about 8:00 A.M. on the morning of July 26th. Check in time was 9:00 A.M. so we had coffee and talked with others waiting for the reunion check in to start. We were greeted by Nancy Johnson of Florida and Nancy Kosman of Pennsylvania. I had been in contact with both "Nancys" concerning the reunion and reunion activities. Mrs. Kosman was president of The Descendants of Marie Ferree organization and Mrs. Johnson is a member of the reunion committee. At 9:00 A.M. when the Welcome Center opened, I went in, paid my reunion fees, purchased a reunion hat and a book on the Ferree history put together by Ferree genealogist, Dr. Charles Heisterkamp. At 9:30 A.M. we assembled downstairs in the Continental Inn for a day of historical and genealogical workshops relating to the Ferree family and genealogy research in general. 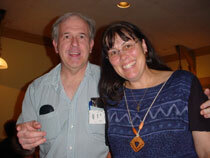 Dr. Heisterkamp led the sessions with other speakers talking about various topics. The morning session included an introduction by Dr. Heisterkamp and a presentation by David Bamberger about the homesteads of Marie Ferree descendants and other interesting places around Paradise. He also spoke about how to gather and how to store genealogy documents. About 12:30 P.M. we had a nice luncheon in the Continental Inn's dining room. The afternoon session included a discussion on DNA testing to establish genealogical links among family members. We broke for "dinner on our own" around 5:30 P.M. Yvonne and I went for a quick meal and then drove around to find an ATM for Yvonne. At 7:30 P.M. we returned to the Inn for the evening meeting in the Welcome Center to discuss specific genealogical questions about our lineage and just chat with some of the reunion attendees. During the day we had met "cousins" we never knew before in person. It was a good and interesting first day. The next morning about 7:30 A.M. we met in the dining room with Nancy Johnson and her daughter, Iris Parker, for breakfast. It was a great breakfast (buffet style included in the cost of the hotel room) of scrambled eggs, French toast, sausage, orange juice, and coffee. 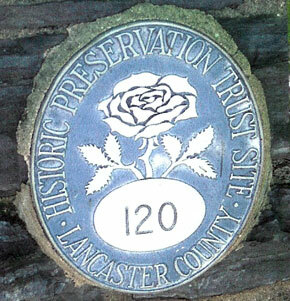 At 9:00 A.M. we boarded a bus for a tour of old homesteads and other interesting sites in Lancaster County pertaining to the history of the Ferree and related families. The tour was led by Samuel Stoltzfus, an Amish historian whose family has been in Lancaster County for generations. He was born in one of the houses originally built by Philip Ferree, son of Daniel and Marie Ferree. Mr. Stoltzfus included several stories about the history of the county, his family's relationship to the county and the Ferree family. A page of the Lefevre Bible. 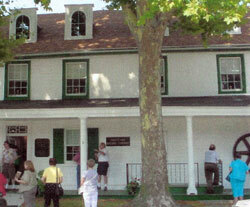 The first stop on the tour was the Lancaster County Historical Society. 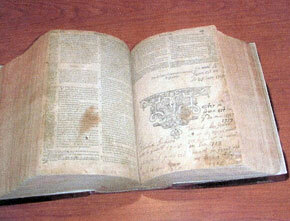 There we saw the Bible that had been smuggled out of France by Isaac Lefevre as he fled France in the late 1600s. He met the Ferree family, traveled with them, and later married Catherine Ferree, the daughter of Daniel and Marie. 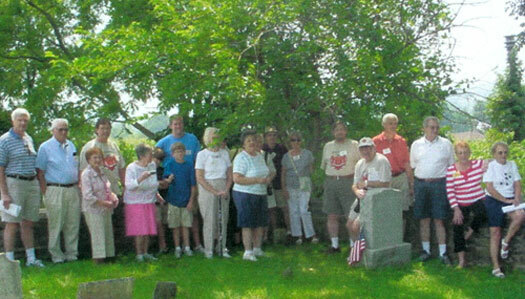 The second stop on the tour was Carpenter's Cemetery where many Ferree and Carpenter family members are buried. The Ferree and Carpenter families intermarried, hence the name. Madame was the first one buried there when she died in 1716. Plaque at entrance to cemetery. Original (in rear) and newer tombstone. Ferree "cousins" at the Marie Ferree monument in Carpenter's Cemetery. The location of the grave of my sixth great grandfather, John Ferree, is uncertain. It cannot be found at Carpenter's Cemetery. Family historian, Dr. S. Kendrick Eshleman, suggested that since John was a Quaker, his grave might not be marked as was the case with early Quakers in Lancaster County. It is also possible he may be buried in a small cemetery near a Quaker meeting house in the county. 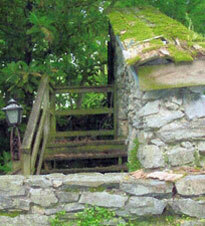 We returned to the Inn about noon. Yvonne and I walked across the street to a restaurant for hamburgers before leaving for the afternoon tour. At 1:30 P.M. we boarded the bus again for our tour of the "Underground Railroad". Our tour guide was Dr. S. Kendrick Eshleman, a Ferree descendant. The program for the reunion stated that the tour was "a trip back in history to a time when slavery existed. Through a network of secret passages slaves attempted to escape to free states". 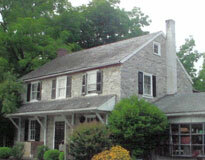 The tour took us to some of the houses that operated in the Lancaster County area which included Paradise, Bird-in-Hand, Gap, and Christiana. 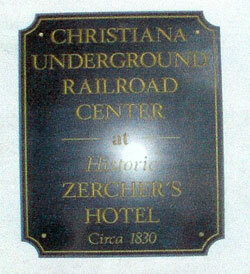 We stopped at the Christiana Underground Railroad Center at historic Zercher's Hotel which houses a small museum. A monument on the grounds commemorates the Christiana riot and treason trials of 1851. I purchased a copy of the book "History of the Underground Railroad in Chester and the Neighboring Counties of Pennsylvania" by Robert C. Smedley. We returned to the Inn about 5:00. At 6:00 P.M. we gathered in the downstairs conference room for a time of socializing and to watch the presentation of a short play depicting Madame meeting with William Penn and Queen Anne and then her meeting with Chief Tawana after arrival in Paradise. The play was written and directed by Donna Jernigan an eleventh great granddaughter of Madame who also portrayed her. Donna's mother, Sylvia Cox, portrayed Madame's daughter, Catherine. 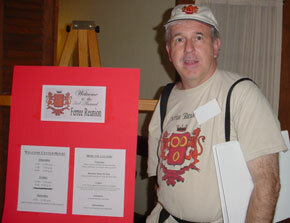 Other players were "volunteers" from among the reunion attendees. Following the play everyone went to the dining room for a delicious banquet and fellowship. A door prize drawing closed the evening. We got a well needed rest that night. The next morning after another delicious breakfast at the Inn and the opportunity to chat with some of the other attendees, we checked out, loaded the car and drove to the Paradise Village Antiques Shop on Highway 30. 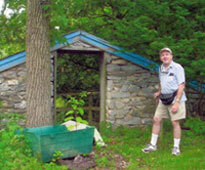 This was an early home of Joel Ferree who made rifles for the colonists during the American Revolution. The remains of his gun shop are located behind this building. All that is left is the front, some of the walls and broken down stairs. We learned the door which used to hang in the antique shop is in the possession of the property owners at their home. From there we went to the Strasburg Railroad Station where we met up with some other "cousins" and took the 45 minute train ride which goes by Carpenter's Cemetery. Then on to pick up some fried chicken for the "pot luck, indoor picnic" at Paradise Township Community Park. 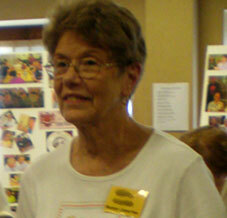 The afternoon included the picnic, reunion business meeting, an auction, and lots of "socializing and togethering". We left for the return trip to Perryville about 6:30 P.M. The reunion was an outstanding event and three days of meeting people I had previously only talked with on the telephone or communicated with by e-mail. 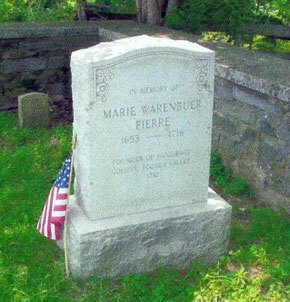 We made a lot of new friends, all "cousins" and descendants of Marie Ferree. It was a great weekend we will never forget! Photos by Chris Ferree and Yvonne March.